Ethiopia 2010: Ready or not, here we come! After weeks upon weeks of preparation, countless e-mails, text messages, and phone calls as we worked to coordinate this trip from 4 different cities in Texas (+ Edward who had gone to Rome for a bit) -- we met once again in San Antonio to complete some last minute preparations. After a rather scintillating orientation with the Office of International Services, we all went off to our errands, packlists, inventories, and a sweet goodbye/goodluck party hosted by some dear friends. Today, after some pre-trip reflection, we dived straight into packing. As I was packing my personal bags the other night, I was slightly intimidated by the piles of team supplies stacked up in my closet. 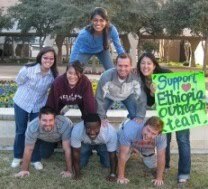 And as my teammates arrived carrying boxes upon boxes of donations, I started to wonder if we would ever get everything to Ethiopia! But a luggage scale, some teamwork and Matt's crazy packing skills can go a long way. By 4PM -- we were sitting in my living room with 18 pieces of luggage packed and ready to go. After some more last minute errands and some serious blessings from Wayside Chapel, we gathered back at my parent's home for a farewell dinner. What better wraps up a busy week of trip prep than a delicious meal cooked by your mom? Thanks mom and dad for all you've been doing to support our team. Food was delicious! To say it's been a rough semester would be somewhat of an understatement. Waiting to see if this trip would happen was rough, and pulling everything together in a period of about 6 weeks was not easy. I recall stating that if our project even made it off the ground, it would be nothing short of a miracle. And lo and behold -- I see on every side of me miracle after miracle after miracle. In the past few months I have learned so much about what it means to be a leader and plan a trip, to coordinate people from all different places, to work with peers and superiors. But above all -- I think I've learned a lot about what it means to perservere in the face of adversity. I'm excited to be leaving tomorrow! I'm sure that our team will have a great time in Ethiopia and that we will learn plenty. And I look forward to the next life lessons that await us as we embark on this portion of the journey. Until next time, au revoir! We will be constantly praying for y'all. It was so good to pray with y'all on Saturday evening.